There’s lots of information below, and if you have a question or need assistance just get in touch. The Mission Parks, Recreation & Culture Department in co-operation with other organizations is pleased to offer several opportunities for those on a limited income to participate in recreation, sport and culture in our community. Cards are non-transferable, not good for cash or credit. Canadian Tire Jump Start is a community based charitable program that helps kids in financial need participate in sport & recreation. Since it’s introduction in 2005, the program has helped over 500 underprivileged Mission children participate in swimming, hockey, soccer and other recreational programs. Those who qualify for the PLAY program (info above) are automatically qualified for the Jumpstart program. Call or e-mail the Leisure Centre for more information on the local chapter or visit the national Jumpstart website here. The District of Mission thanks Canadian Tire for their on-going contributions to this well utilized and worthwhile program. At KidSport™ we believe that no child should be left on the sidelines. That is why KidSport™ eliminates the financial barriers to sport participation. KidSport™ is a community-based sport charity that provides grants for Canadian children age 6 to 18 to participate in a season of sport of their choice. For KidSport™ success is measured by the number of new sport opportunities created for children who would otherwise not have a chance to play. Click here for an application form. Mission Parks, Recreation & Culture has something for everyone! 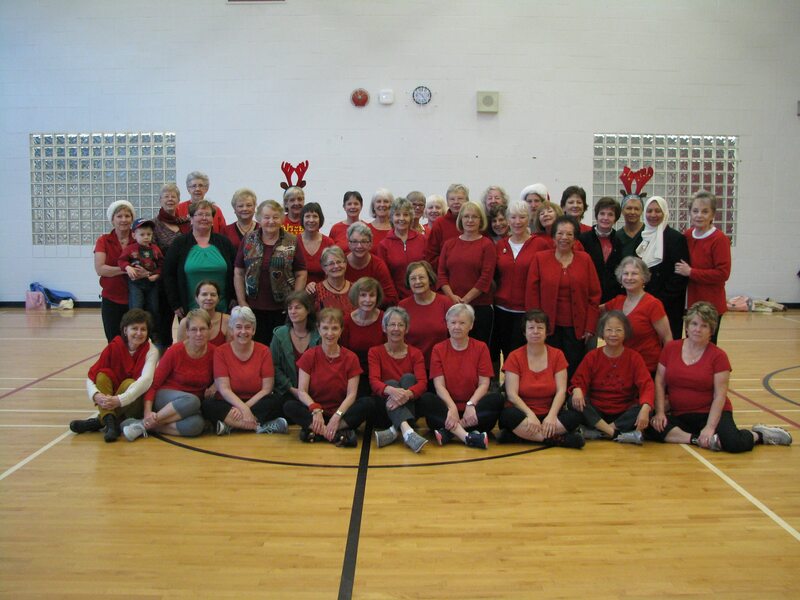 The Mission Leisure Centre strives to be a senior friendly place and through programs, facilities and support our department caters specifically to the unique needs and interests of this demographic. Mission Parks, Recreation & Culture supports the initiatives of the Mission Seniors Centre Association. The Mission Community Activity Centre serves as a hub for seniors in our community and the association offers a variety of programs from bingo, line dancing to health & wellness workshops. Check out the Mission Seniors Activity Centre for specific details on what they have to offer. Our Moving Forward program has proven to be a hit with seniors. This series of registered fitness programs is ideal for those new to fitness, mature adults or those getting back into the fitness routine. Our instructors encourage participants to work at their own pace and help modify exercises and present challenges tailored to both the group and the individual. Contact reception or look for Moving Forward course offerings online. Health and wellness is not just about fitness, it’s also about leisure and learning. Check out our program offerings through e-reg such as cooking or dance and learn something new. Studies have shown that 75% of people who exercise are not getting the results they want. 90% of the people who are happy with their results are working with a personal trainer. Anyone can benefit from a little extra personal attention, especially when it really does deliver results! Results – A certified Personal Trainer will help you reach attainable, realistic and healthy goals. Motivation – You’ll work harder with your Personal Trainer then you would by yourself. You will set and reach your goals quickly AND have fun doing it! Efficiency – You’ll SAVE TIME. You will learn exercises and techniques that are proven to be effective. Safety – Without the guidance of a Personal Trainer you run a much higher risk of getting injured. Serious injuries can delay or even reverse your progress towards your fitness goals. FUN – Our Personal Trainers LOVE what they do and it shows! They will engage and inspire you making your workouts something you look forward to! 37,000 Reasons to Advertise With Us! 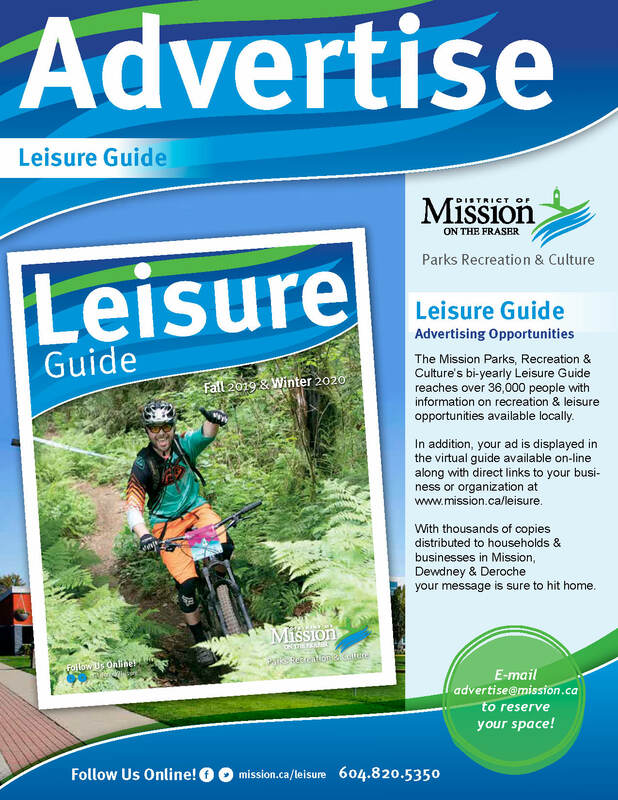 The Mission Parks, Recreation & Culture’s Leisure Guide reaches well over 37,000 people with information on recreation & Leisure opportunities available locally. The Guide is distributed two times per year and has become the standard in leisure & program information for the community. In addition, the guide is posted on line in a convenient flip view format along with direct web links to your business. With 15,000 copies distributed to households & businesses in Mission, Dewdney & Deroche your message is sure to hit home. Download our media package & advertise with us! The Mission Leisure Centre is a hub of leisure activities in Mission. Our comprehensive facility features pools, rinks, a curling facility, gymnasium, fitness studio, weight room, squash & racquetball courts, multipurpose rooms, a physiotherapy clinic and concession. So whether you enjoy yoga or swimming, basketball or hockey, dancing or want to learn first aid, or simply enjoy a coffee and socialize with friends, there’s something for everyone! On holidays, the Leisure Centre is open from 8:30 am – 4:30 pm, except closures for Labour Day and Christmas. Drop-in swimming and the weight room are available on most statutory holidays. For your convenience, most programs are not scheduled on statutory holidays. If you are planning to be away, please inquire about registering. Your birthday party package includes a fun-filled hour session in your choice of the pool, ice arena or gym for up to 10 children (including the birthday child), a decorated party room with a birthday banner, colored paper roll for tables/doodling is provided. Parents are welcome to bring extra themed decorations and can set up with the assistance of the party host. Delicious, hot food from Red’s Grill with your choice of 3 menu options is included for each child. Ice skate and helmet rentals are included for skate parties. Just bring a birthday cake, candles and goody bags. Skate & helmet rentals included. Book online or in-person at the Leisure Centre. unsafe to the person or others around them. impedes staff’s ability to conduct business. Together we make all recreation safe. Day Camp is a fun & exciting camp opportunity offered on school Professional Days, Spring Break, during summer and winter vacation. Activities include swimming, skating, sports, games, arts & crafts & more! Six lane – 25 meter Main pool used primarily for length swimming, lessons & water fitness classes. The pool is maintained at 29 C (84 F). 3,000 sq ft Leisure Pool featuring two 15 meter lanes, a Vortex with 23 velocity jets, water cannons, bumble bucket, and much more! The pool is maintained at a comfortable 32.5 C (90 F). Sauna, steam room, teach pool, tarzan swing and more! Room includes an Xbox, Pro Billiards table, table tennis, air hcokey, home theatre setup with giant 6 foot screen, great sound system & more! Open Tue, Wed & Thu from 3:00 – 9pm, Fridays 3:00 – 9:45pm & Saturdays 5:00 – 8:45pm. Wednesdays FREE youth gym: 3:30-5pm, dodgeball, basketball & more! A wide variety of multi-purpose rooms ranging in size from 400 – 4,000 sq. feet are used for programs and available for programs and community use. Click here for pictures and more information on available rooms throughout the District including School Gyms & Parks. To reserve space e-mail the booking clerk. This park features a large number of interactive spray devices as well as the popular tumble buckets. Washroom facilities and picnic tables are also available on site. The water spray park is open from 10am to 8pm every day starting the May long weekend & ending Labour Day. The park is also open during weekends in September – weather permitting. Located in the lower lobby of the Leisure Centre opposite the pool. Featuring a wide variety of food & beverages including daily specials. Provides all food and beverage services for the Mission Leisure Centre including Birthday Party packages and special events.